Are you a child-based organization, maybe a preschool, nursery or toddler group? Are you looking for a magical Christmas adventure like no other? Your search ends here! 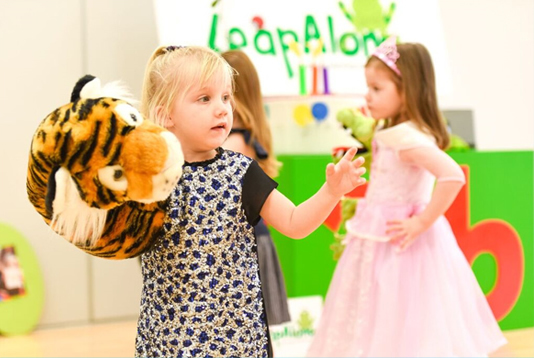 LeapAlong will deliver a 1 hour party and with the use of our great props, puppets and games, we will leave the children in a great Christmas spirit. Suitable for 2-5 years. Our magical christmas adventure will take the children on a seasonal journey that will fill their little hearts with wonder! They’ll encounter all sorts of delights during their Christmas party, from marching up the hill with our pom poms to the snowy castle and meeting our father Christmas dragon, to fishing in our icy sea with their very own fishing rods to catch their Christmas present from us. Our children’s Christmas parties can accommodate a maximum of 40 children. The recommended age group is 2-5 years, but we welcome older and younger children to join in. We will arrive half an hour before our start time and would only need a table and plug socket – the rest you can leave to us. All our staff are caring, highly experienced and have an enhanced DBS. You can rest assured, too that our company has a £10 million public liability insurance policy in place. Parties are £100.00, and a £50.00 deposit is regard to secure a date.